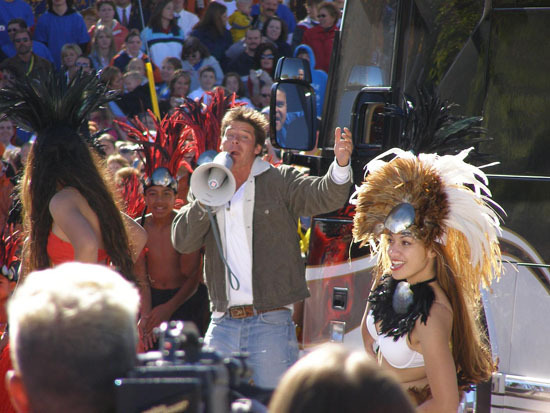 HOOPLA: Ty Pennington works the crowd as Polynesian dancers entertain at the revealing of the new Pauni home. / Photo by Rebekah Bradway. 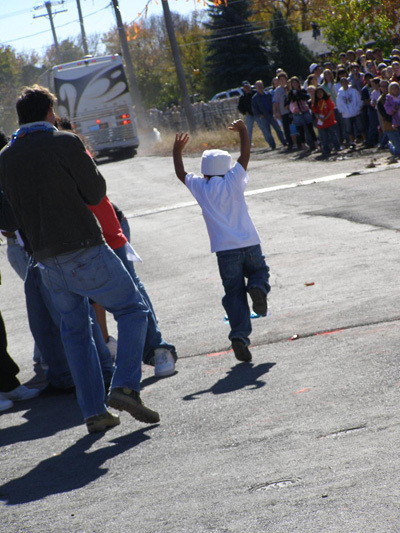 October 23, 2006 | The moment everyone was waiting for finally came and went Sunday afternoon, leaving emotions high, a community changed for the better and a deserving family with a new home. "It's just unbelievable," said Troy Kartchner, president of Kartchner Homes, the company that built the house. The builders, along with numerous other subcontractors and companies, worked around the clock all week long to be able to complete the home in time for the family's return on Sunday. Hours before the family even arrived home, hundreds of people were stretched out along the road for a block and then wrapped around to the other side of the street, waiting to cheer the family on as the new home was revealed. 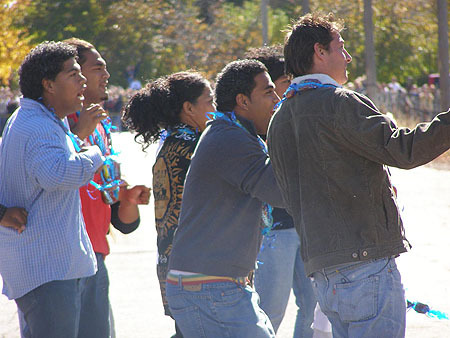 While they waited, the spectators were entertained by a Polynesian band and dancers called Malia Oloe. Some of the members are related to the Pauni's through their father and were more than willing to participate when the producers called them. Fifteen young girls and six older girls in grass skirts and feather headdresses did various Polynesian dances to the fast and rhythmic beats of the various types of drums played by five band members. 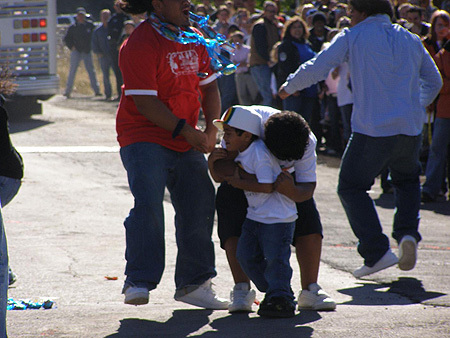 "This is just the big family she-bang," said group leader Oliana Tuia. Although the crowd enjoyed the dancers, the main event came at about 1:45 in the afternoon when an SUV-style limousine carrying the members of the Pauni family rolled up to the newly built house, where the family would see it for the first time. 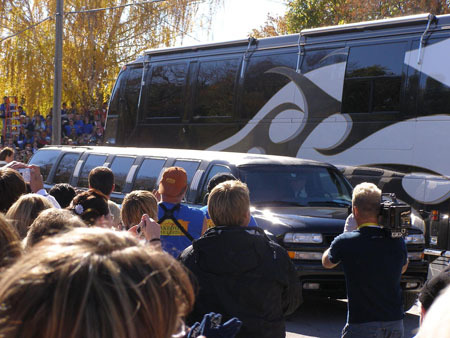 In the tradition of Extreme Makeover: Home Edition episodes, when the family arrived there was a huge bus in front of the house so the family couldn't see it until host Ty Pennington was ready to show it to them. Pennington gathered the family in a circle and talked with them and then, along with the whole family, shouted, "Move that bus!" Unfortunately they had to do it three times (that's show business) to get it on camera, before the bus finally started up and pulled away to the sound of a cheering crowd. The reaction of the family was better than anyone could have expected. As soon as they saw the house, some began jumping and screaming, others began crying, and one Pauni son even went to his knees in amazement. Most touching however, was how the children circled around their crying mother, hugging her tightly as the reality set in. "The family's reaction was so priceless," said Tracy Hutson, a cast member. The crew of Kartchner Homes and the rest of the Extreme Makeover cast then joined the family in the middle of the road, hugging and thanking each other. "It was wonderful to come over to them and see their tears of joy and love," said Troy Kartchner, president of Kartchner Homes. He said he wishes everyone could have been able to give the Pauni family hug because they are such a great and deserving family. "Thank you everyone!" shouted an emotional George Pauni who took some time to shake hands and hug some friends in the crowd before rejoining his family's celebration. Even Kartchner and Pennington shared a hug for a job well-done. Will Wheelwright, a radio announcer for 95.9 KLZX, told Kartchner that he had seen the show several times and said, "That's the best reaction I have ever seen of any family." Ed Sanders, carpenter and cast member, said that it's people like the Pauni's and days like Sunday that is the reason they do this show. "They deserve us guys being here," he said. And he thinks they came just in time. The old house was falling apart and the family had no way to fix it. But despite that, they made the best of what they had and served others in the process, and that is what made them such a deserving family. "It's not until you see a family like this that you realize how good your life really is," Sanders said. Along with the new house and the cash donations from the community, the Pauni family was given an RV from Camping World and FreedomRoads, with the name of their catering business, "D.J. Island Catering," printed on the side. The oldest siblings will also receive five full-ride scholarships to Stevens-Henager College to get Bachelor's degrees, an amount that totals $274,500, said Howard Ballif, the admissions consultant for the Logan campus. The younger siblings will have access to an $8,000 Legacy Grant, meaning they will have $8,000 off tuition if they attend school there in the future. There has been no end to the support the Paunis have received from the community and the role they played did not go unnoticed or unrecognized by the cast, crew and family. "I don't know what it is about Utah, but it's always, always, always a great crowd," Sanders said. Likewise, Hutson said she has loved her time in Logan and everyone has been wonderful to her. "If I needed anything or just getting stressed out, I could just look in the Yellow Pages and call anyone," she said. Kartchner said the Extreme Makeover staff has told him they don't experience in most cities what they have experienced her in Logan. "I've seen a few of them get emotional as they've talked about what they've felt," he said. Now the TV crews are leaving, the crowds are thinning, and real life will begin again for the hundreds of people who put it on hold this week. The glamour will soon fade away, but the effect it has had on the Pauni family will not. 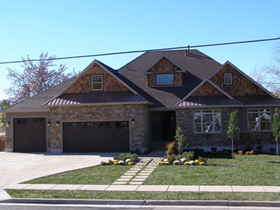 This home wasn't just a free gift; it is a reward that came as a result of their hard work. Not just to survive, but to make the world a better place. Sanders put it simply when he said, "The Paunis deserve every square foot of that house."